Chefs Eli Collins, Sarah Rich Evan Rich, Aaron Silverman and Peter Serpico work together at a.kitchen on Monday, Sept. 17, 2018. Rittenhouse Square’s a.kitchen, known to draw clientele with a savvier palette, produced some of the finest dishes diners have seen in perhaps decades for a private dinner Monday night by old friends who got their start in the same kitchen. Chef Peter Serpico of Serpico, Chef Eli Collins of a.kitchen, Chef Aaron Silverman of Washington D.C.'s Rose’s Luxury and Pineapple and Pearls, Chefs Evan and Sarah Rich of San Fransisco’s Rich Table, and Chef Eli Kulp of Fork came together for a collaborative reunion dinner and to help promote the Rich’s first cookbook, Rich Table, which hits bookstores this month. Why this who’s who of culinary talent taking over a Philadelphia restaurant? Kulp, the Richs, Serpico and Silverman all began their culinary careers working in New York City’s critically acclaimed restaurant, Jovia. They all became lifelong friends, hadn’t seen each other in more than a decade, and Kulp said, let’s do it here. On the special menu were spot prawns with smoked watermelon and sake billi bi (a creamy mussel soup), mozzarella tortellini with eggplant soffrito and nardello peppers, mushroom stew with braised duck and foie gras, and a dry aged New York strip with green bean chimichurri and fried shallots. Each course was paired with a wine, and dessert consisted of a caramelized olive cake with kiwis and cream cheese ice cream. 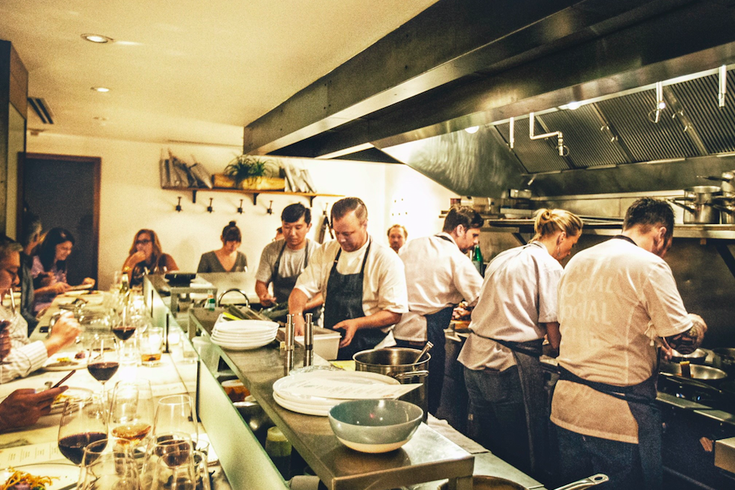 Each chef took turns in a.kitchen’s small space – most unfamiliar with their surroundings – but working fluidly behind the line. “For this to have come together would have taken the force of God,” Kulp told PhillyVoice. Kulp, who was one of the critically injured passengers of the 2015 Amtrak train derailment and is in a wheelchair, is culinary director and founder of High Street Hospitality Group, which oversees a.kitchen+bar, High Street on Market and Fork. His business partner is Ellen Yin, who jumpstarted the restaurant scene in Old City when she debuted Fork in 1997. “It’s incredible to have all these chefs here because to have people from all over the country coming in and meeting at this point is absolutely a tremendous opportunity,” said Yin. “So many of these award-winning chefs working out of this tiny little kitchen and to have each of them here is really remarkable. Monday night's collaborative dinner at a.kitchen was one of several stops on Rich Table’s upcoming cookbook tour. Click here for dates, including a stop at High Street on Hudson in New York City. Add Jenny's RSS feed to your feed reader.